A couple of weeks ago I walked into my friend Carol’s house — she has kids roughly the same age as mine — and was struck by how grown-up her house looked. It was spotless. Her sofas looked normal, as if no one had ever puked on / spilled milk on / mashed food into / used them as a trampoline. The overall effect of walking into a clean, puke-free house was magical…and serene. 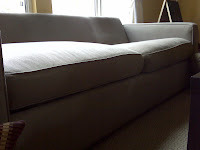 When I walked back into my own house, the saggy, stained sofas that sit in our family room made me glum. Though I entertained fantasies of a new beige-colored microfiber sectional with leather trim, that was out of the question. I asked the kids if they would continue to jump on / step over, build forts with / color near / sneak food on said hypothetical sofa and they answered yes. So, I set out to refurbish! 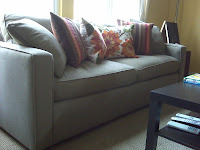 A cursory call to reupholsterers, who would re-stuff my formerly down-filled cushions, yielded a quote of roughly a thousand dollars for the sofa. That included a wait time of a couple of weeks while the special feathers were ordered, and a period of time during which I’d have no cushions upon which to sit. Not good enough for my need for immediate gratification. 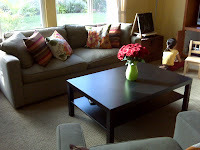 This transformation inspired me to look for other low-cost ways to reduce the offensiveness of my family room. Here’s what the wall opposite my sofa used to look like — it was basically a mishmash of cheap furniture that somehow migrated down from the playroom. 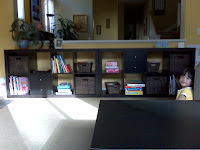 A visit to IKEA and investment in Expedit bookshelves, filled in with baskets I’d gotten from Target for the play room a couple of years ago, plus a coffee table spruced up the room in a remarkably low-risk fashion. 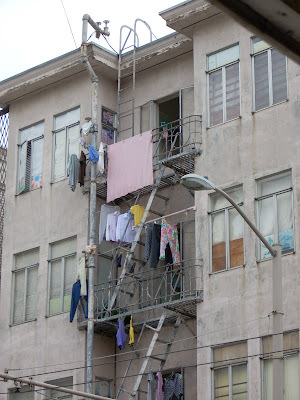 While I’d like to be able to say that my house looks like this all the time, and not just every other Tuesday when a certain cleaning crew rolls in to save the day, I can’t. But it does look less bad. Restructured my jeans collection. I have about six pairs of jeans in rotation, two of which I wear pretty regularly. That doesn’t seem right; I should want to wear all of them. My analysis told me that the two pairs I wore were hemmed for wear with heels. Which means that half the time I’m forced to wear heels just because I want to wear those nice jeans. But I also want some pairs to wear with flats. My flats jeans were all faded and on their last threads. So I took a few of the other pairs that I wasn’t wearing, mostly because I didn’t like the fit or leg width quite as much, and brought them to the tailor to have them re-made into jeans for flats. Voila! Three new pairs of jeans at a fraction of the cost of new ones. My current favorites are Joe’s Jeans, so I made sure that I had one high heeled pair and one flats pair. And I just love dark washes — they make you look so skinny! Lopped off my capris. I had several pairs of capris that I bought about three years ago that just didn’t look right anymore, and a pair of Burberry-print slacks that had just too wide a flare. One boring evening (out of many) I took a pair of scissors to the slacks and hand-hemmed them to be knee-length shorts. Suddenly my tired looking slacks became a set of cute shorts! Except for the questionable workmanship. So the capris are getting the same fate. Perfect for wearing with my cream-colored nubuck cowboy boots that I got on super sale at a boutique last month. Belted it out. Being on spending moratorium wasn’t much fun, but in my book, spending money on belts doesn’t count! I acquired three new belts: 1) a patent leather wide belt in a royal purple, 2) an amazing and cheap reversible (!) studded leather belt from Steve Madden — black on one side and brown on the other, and 3) a thin, stamped python belt from Betsey Johnson. Sticking a belt on all my tops suddenly transformed my clothes — and I like belted tops over skirts. I’ve been wearing loose-fitting, billowy tops for the past year or two, both capitalizing on the trend and taking the opportunity to let my gut hang loose, so belting these tops was a nice change. As a bonus, I took the Steve Madden belt to my local cobbler, and he pounded a new buckle hole into it for me at no charge. Accessorized. I’m a big fan of long necklaces — 32 inch and 34 inch ones — layered. I just think they look so great over the longer tops that are around now (and that I hope will stay around til I die. Fashion gods, please do not allow the cropped tops of the late ’90s to come back unless I get a personal trainer!). I have a few in my regular rotation that I got from Target, which has a surprisingly fresh and trendy accessories section — and J. Crew is currently having a final sale online where you can get pretty decent deals on gold plated jewelry for layering. I also bought a giant flower pin made of feathers that I am sure is going to look right any day now. So good news: my husband got a job! It’s a 3-minute commute from our house and his office will have lavish facilities like windows, in-office closets, a beautiful gym and a really nice cafeteria. I am jealous. He starts in two weeks. Just in time to save me from the classics. Now that I’ve been implementing my own economic stimulus plan through my crack addict purchases of Botkier handbags, I’ve joined FreeShipping.com. Even though we offer this program through the company where I work, I was (and am) skeptical of anything with the word “free” in it. So let’s be clear: the program is not free. It can, however, be financially beneficial if you shop online. 1) Membership is $6.99 / month, billed annually — so $83.88 a year. They currently have a 30 day free trial so I’d recommend doing that — why not. You can cancel the membership anytime. You can get up to $500 / year in shipping rebates, including return shipping. 2) When you shop, log in to FreeShipping.com and search on the merchant you plan to patronize. They have over a thousand merchants, big and small (I’d say they capture about 65% of my online purchases). Click on the merchant you are shopping, and you’ll be sent over to their website. Complete your transaction. 3) Go back to FreeShipping and make a claim. This does require printing out your receipt and mailing it in, and I suspect their business model relies on the laziness of people and their inability to mail something in even if they get money back for it, but it’s a great program for the miserly people who get profiled in the Famously Frugal section of Real Simple magazine. Or people like me, whose husband just got laid off, but who believes that by sending in these rebates I am actually earning money and therefore am entitled to another purse. $500 would buy me a mighty nice Botkier on eBay. Look for more money-saving tips as I head toward financial ruin!